Last year the heavy snowfall end of April ruined 99% of the harvest throughout of our Canton but this year we stumble over cherries on every corner. The trees are decorated with high reaching ladders and baskets on busy people picking the dark red cherries from high above. I could eat cherries every day, one of the last fruit only available in season! That is why it is still such a distinct taste and will always be linked to June. Unlike strawberries and blueberries. Kind of sad. I might be a bit late for this post , but hope you still find cherries on the market to trie this pretty version of a cherry pie half covered. The great thing about this pie is that the steam can evaporate and wont break the pie crust. Make sure you refrigerate the dough often in between the handling and keep it cool, this way it is easier to handle and transfer the cut outs. And the dough will stay white and pretty, for that first photo you want to take. Don't give up when it doesn't turn out the way you want at the very first try! The dough is really great to work with and will allow you to make mistakes, and this pie is absolutely worth the effort! A proof of love to anyone who has the privilege to get it served! Make your family speechless! Mix the flour and the butter in your standup mixer with the paddle attachement until loose breadcrumbs form. Add the sugar, salt (and flavorings, if you like ), mix through and add the egg yolk and the milk, beat until the dough starts to come together, stop the machine and transfer the dough to your work surface to knead the dough until you can shape a ball. Cut in half and flatten each part to a 1cm disc, wrap in cling foil and refrigerate at least 1 hour. 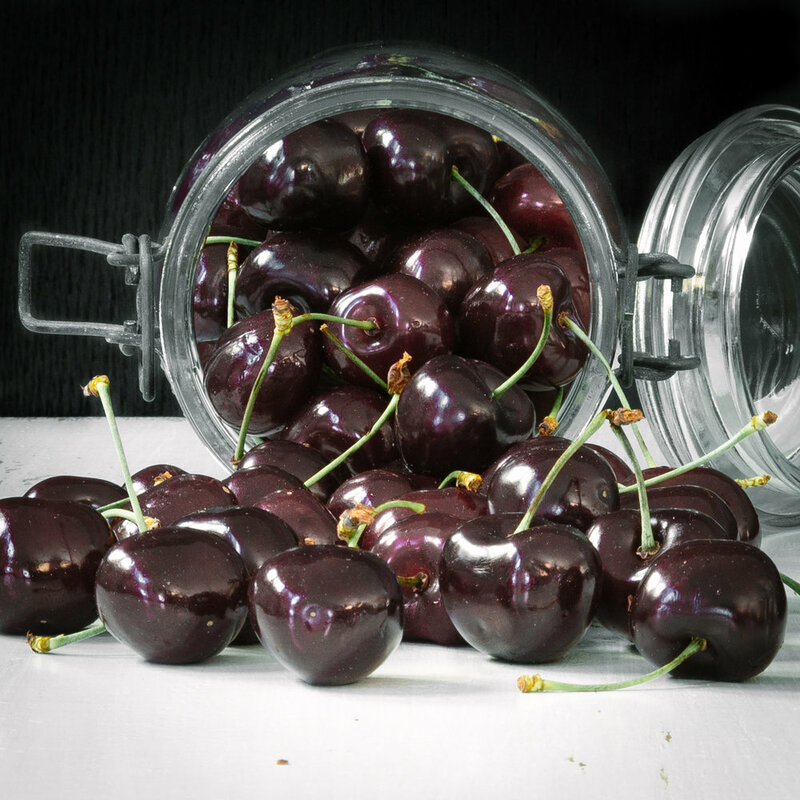 Remove the stones and stemes from the cherries, and macerate them in a bowl with the sugar and lemon juice. Stir occasionally. Then drain the juices and blend the fruits briefly so the big firm cherries are broken into smaller pieces. That will help you to decorate the pie with the filling later. 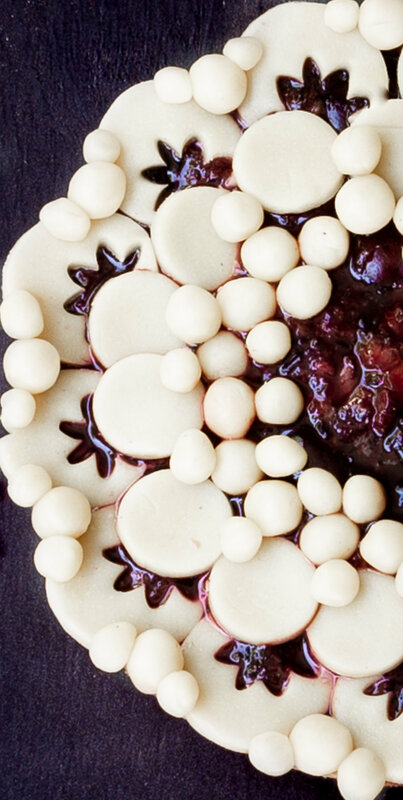 Prepare a tart form or a tart ring set on parchment paper on a baking sheet. Preheat the oven to 180°C fan/200°C convection. Between two sheets of non sticky parchment roll out the first ½ of the chilled dough to 24 cm and transfer it to the ring. Let the dough sink into the form, pressing the parchment neatly to the sides, remove the parchment, cut off the excess dough with a knife along the the rim, with a fitting parchment line the crust again and fill it with beans or lentils to weigh down the paper and blind bake the crust first for 15 minutes then another 15 minutes with the parchment and lentils removed. So the crust becomes evenly baked and hardens. Remove from the oven an let cool. Now use the second half of the chilled dough to make shapes. Can be circles only or leaves or anything you come up with, this is your time to be creative. Chill the shapes again. When the crust has cooled down, fill it with the macerated cherries almost to the rim of your crust, decorate the pie with the shapes and refrigerate again for 30 minutes before you bake it aply the egg wash carefully, that is easiest when the dough had enough time to chill, sprinkle some demera sugar over the pie and now finally bake it for 20-25 minutes. Let cool and refrigerate before you serve it, remember a pie is not easily transfered, so make sure you have a special tool like a large cake palette or helping hands.